DOMS - Delayed Onset Muscle Soreness: No Pain, No Gain? Is DOMS Necessary to Build Muscle? Are stretch, tear and DOMS what makes concentration curls an effective biceps builder? Can we use the soreness as a gauge for the efficiency of our training? In last Sunday's first installment of our discussion on delayed onset muscle soreness (DOMS), we looked at what causes DOMS as well as treatment methods and supplements for relieving its symptoms. This led us to today’s big question: Is DOMS necessary for muscular adaptations to exercise? No pain, no gain, right? Before we can discern whether DOMS may benefit muscle growth, we need to look at what muscle growth is and what causes it, so that we may see if DOMS is in fact a piece of the puzzle. During muscle fiber hypertrophy, contractile proteins proliferate, and the muscle fibers enlarge to support this growth (Vierck. 2000). While there are many factors regulating this process, from gene expression to hormones and other growth factors, the two necessities for hypertrophy are some form of increased muscular tension, damage, or stress (Goldberg. 1975), and a positive net protein synthetic response with adequate energy availability (Miyazaki & Esser. 2009). Through exercise, the former is accomplished and paves the way for the repair processes that require the latter to occur. In other words, without a need to increase muscle size and strength, hypertrophy will not happen. Likewise, even if there is a need, without proper nourishment hypertrophy simply cannot happen. So with exercise being the trigger and nutrition the ammo, what is left to play the gun? Skeletal muscle does not undergo significant cell replacement once mature (Chargé & Rudnicki. 2004), and thus a repair mechanism for any microtrauma is essential. This medic is the satellite cell, a type of stem cell found only within mature muscle tissue. After microtrauma, satellite cells activate, proliferate, and ultimately fuse to one another and existing muscle fibers to form new myofibrils (Toigo & Boutellier. 2006). All parts of this regenerative weapon rely on one another. The satellite cells mediate the hypertrophic process, but without a need (the exercise) they will not start, and without the nourishment (energy availability) they cannot function. All else that impacts the accuracy of the gun can be thought of as the factors influencing satellite cell efficiency. Hormones could be wind speed, gene expression the user’s accuracy, and perhaps DOMS is the distance to the target (or not ;-). The hypertrophy process begins with microtrauma and an ensuing accumulation of calcium within the damaged muscles (Sorichter. 1999). This is shortly followed by a rapid stimulation of satellite cells via hepatocyte growth factor (HGF) and nitric oxide (NO), both of which rely on the changes in calcium levels within the muscle tissue (Tatsumi, 2010), and satellite cells may even be activated by the calcium flux itself (Hara, et al., 2012). Furthermore, HGF secretion is proportional to the extent of the muscle damage (Tatsumi, et al., 1998). Therefore, it seems plausible that greater muscle damage leads to greater satellite cell recruitment, especially since the activation of satellite cells is exclusive to the fiber that has become damaged and satellite cells of one muscle fiber will not respond to injury of adjacent muscle fibers (Chargé & Rudnicki, 2004). As it just so happens, DOMS inducing eccentric contractions disrupts muscle integrity more so than concentric or isometric contractions (Faulkner, 1993). What may seem odd, however, is that EMG activity has been shown to be lower in eccentric loading compared to concentric loading (Westing. 1991), suggesting less fiber recruitment. Just a reminder: This is a twp-part series on Delayed Onset Muscle Soreness. You can switch back and forth between part I "What Is DOMS & How Can It Be Managed? Science, Strategies, Supplements" & part II "No Pain, No Gain? Is DOMS Necessary to Build Muscle?" by clicking on the images to the left. In their study, (Westing. 1991) measured the torque and EMG activity of the quadriceps muscle at different movement speeds between a knee angle of 30° and 70° on the leg extension for both the concentric and eccentric portions of the exercise. The participants were 14 highly trained athletes that were accustomed to performing maximally during training. As you can see in Figure 1, average torque of the eccentric activity was significantly greater than that of the concentric activity across all movement speeds, but the EMG activity was significantly lower and continued to lower as movement speed increased. The fact that the EMG values of the eccentric activity are below 100% shows that the activation during the concentric phase was higher, even at lower speeds and despite “maximal” effort. Figure 1: Exemplary data from Westing (1991) showing the mean and SEM torque- and EMG-velocity relationships during the eccentric (open symbols) and concentric (filled symbols) tests. Actually, this gives support the idea that eccentric exercise is more damaging. It is hypothesized that neural drive to the working muscle is reduced under conditions of extreme muscle tension (i.e. less EMG but more torque) to protect the muscle from injury that could result if it became fully activated (Moore. 1984). 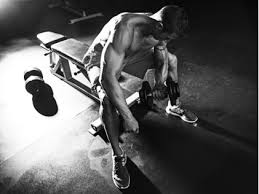 Regardless, single bouts of eccentric contractions have been shown to increase the satellite cell content and activation status in Type II muscle fibers (Cermak. 2013). Inflammation - Friend or Foe of Muscle Growth? Learn more about eccentric training and satellite cell recruitment and how even fat cells can become muscle. Once the damage has been done, the repair process may begin. As mentioned in "DOMS - Delayed Onset Muscle Soreness: What Is DOMS & How Can It Be Managed? Science, Strategies, Supplements" (read article), an acute inflammatory response follows microtrauma. This is also the time that DOMS normally makes it move. During this time, the damaged muscle releases several cytokines, while white blood cells such as neutrophils and macrophages invade the damaged tissue and release several growth factors, all of which may regulate satellite cell activity (Toigo & Boutellier. 2006). Creatine kinase, for example, is a standard indirect measurement of muscle damage (Banfi. 2012). The cytokine interleukin-6 (IL-6) appears to be an essential regulator of satellite cell mediated hypertrophy, and genetic loss of IL-6 blunts the hypertrophic response (Serrano, et al. 2008). There also appears to be a close association between cytokine concentrations and muscle damage (Pedersen, Ostrowski, et al. 1998), with (Bruunsgaard, et al. 1997) showing that IL-6 concentration is higher after eccentric cycling compared with concentric cycling. Likewise, interleukin-15 (IL-15) is another highly anabolic player in the inflammatory response to muscle damage (Furmanczyk and Quinn 2003), and is elevated following resistance exercise but not treadmill running, suggesting a need for microtrauma in its stimulation (Pedersen, Akerström, et al. 2007). Learn more about the different splice variants of IGF-1 and how they figure in the process of muscle hypertrophy and why systemic measures may mislead us. Insulin-like growth factor 1 (IGF-1) has also received much attention due to its ability to increase muscle mass via muscle protein and DNA augmentation (Chakravarthy, Davis and Booth 2000). These effects are at least in part attributed to the activation of satellite cells and increased protein synthesis within the muscle fibers (Barton-Davis, Shoturma and Sweeney 1999). And guess what? Damaging exercise increases IGF-1. A study by (Bamman, et al. 2001), for example, showed that eccentric exercise increased IGF-1 gene expression by 62% while decreasing inhibitory genes by 57%. Oh, and concentric exercise produced non-significant changes in the above markers, suggesting that it was indeed the structural damage responsible for the IGF-1 expression. Lastly, the aforementioned HGF acts as a chemo-attractant for satellite cells (Bischoff 1997), effectively stimulating satellite cells to migrate to the place of injury, where it then has a direct effect on satellite cell proliferation and differentiation (Vierck, et al. 2000). Oddly enough, abnormally elevated concentrations of HGF actually inhibit muscle regeneration via up-regulation of myostatin (Yamada, et al. 2010). Since HGF is secreted by regenerating muscles for the first three days following injury (Jennische, Ekberg and Matejka 1993), its accumulation could act as a regulatory “stop” mechanism that marks the end of muscle repair via satellite cells (Chazaud 2010). A final indirect notion of the importance of DOMS is the idea that NSAIDs – a common treatment method – reduce the hypertrophic response. Recall that both NO and HGF are responsible for activating satellite cells in the early stages of the repair process. This process appears to be partially regulated by the cyclooxygenase (COX)-2 pathway, which releases various prostaglandins known to stimulate satellite cells (Bondesen, et al. 2004). The problem is that NSAIDs inhibit this pathway and thus may impair the hypertrophic response (Schoenfeld 2012). Indeed, studies have shown NSAID usage following eccentric exercise reduced satellite cell activity for up to eight days (Mikkelsen, et al. 2009). Summary: Hypertrophy involves a complex array of anabolic and catabolic processes working in a downstream manner to favor protein synthesis over degradation. DOMS is not necessary, may however present itself during the early stages of exercise. What is necessary is a mechanical overload of the muscle resulting in microtrauma. So train hard, train smart, and may the growth be with you. So is DOMS necessary? DOMS can be thought of as a sign of muscle damage, but it is the damage itself and the subsequent inflammatory response that are responsible for hypertrophy. DOMS is actually a rather poor indicator of muscle damage and will not always reflect the magnitude of the damage (Nosaka, et al., 2002). Nor will it always be present. Studies have shown that even a single bout of eccentric exercise reduces and may negate DOMS in subsequent bouts (Nosaka. 2001), and these effects persist for at least several weeks (Clarkson. 1992). This would explain why soreness is common in the beginning of a new routine full of unaccustomed damaging exercise, but fades as time progresses. And in fact Flann (2011) showed that using a three week acclimation protocol prior to beginning an eight week eccentrically loaded leg press protocol significantly reduced DOMS and markers of muscle damage compared to beginning the routine cold turkey. Bamman, M M, et al. "Mechanical load increases muscle IGF-I and androgen receptor mRNA concentrations in humans." American Journal of Physiology - Endocrinology and Metabolism 280, no. 3 (2001): E383-E390. Banfi, G, A Colombini, G Lombardi, and A Lubkowska. "Metabolic markers in sports medicine." Advances in Clinical Chemistry 56 (2012): 1-54. Barton-Davis, E R, D I Shoturma, and H L Sweeney. "Contribution of satellite cells to IGF-I induced hypertrophy of skeletal muscle." Acta Physiologica Scandinavica 167, no. 4 (1999): 301-305. Bischoff, R. "Chemotaxis of skeletal muscle satellite cells." Developmental Dynamics 208, no. 4 (1997): 505-515. Bondesen, B A, S T Mills, K M Kegley, and G K Pavlath. "The COX-2 pathway is essential during early stages of skeletal muscle regeneration." American Journal of Physiology - Cell Physiology 287, no. 2 (2004): C475-C483 . Bruunsgaard, H, H Galbo, J Halkjaer-Kristensen, T L Johansen, D A MacLean, and B K Pedersen. "Exercise-induced increase in serum interleukin-6 in humans is related to muscle damage." The Journal of Physiology 499, no. Pt 3 (1997): 833-841. Cermak, N M, et al. "Eccentric exercise increases satellite cell content in type II muscle fibers." Medicine and Science in Sports and Exercise 45, no. 2 (2013): 230-237. Chakravarthy, M V, B S Davis, and F W Booth. "IGF-I restores satellite cell proliferative potential in immobilized old skeletal muscle." Journal of Applied Physiology 89, no. 4 (2000): 1365-1379. Chargé, S B, and M A Rudnicki. "Cellular and molecular regulation of muscle regeneration." Physiological Reviews 84, no. 1 (2004): 209-238. Chazaud, B. "Dual effect of HGF on satellite/myogenic cell quiescence." American Journal of Physiology - Cell Physiology 298, no. 3 (2010): C448-C449. Clarkson, P M, K Nosaka, and B Braun. "Muscle function after exercise-induced muscle damage and rapid adaptation." Medicine and Science in Sports and Exercise 24, no. 5 (1992): 512-520. Faulkner, J A, S V Brooks, and J A Opiteck. "Injury to Skeletal Muscle Fibers During Contractions: Conditions of Occurrence and Prevention." Physical Therapy 73 (1993): 911-921. Flann, K L, P C LaStayo, D A McClain, M Hazel, and S L Lindstedt. "Muscle damage and muscle remodeling: no pain, no gain?" The Journal of Experimental Biology 214 (2011): 674-679. Furmanczyk, P, and L S Quinn. "Interleukin-15 increases myosin accretion in human skeletal myogenic cultures." Cell Biology International 27, no. 10 (2003): 845-851. Goldberg, A L, J D Etlinger, D F Goldspink, and C Jablecki. "Mechanism of work-induced hypertrophy of skeletal muscle." Medicine and Science in Sports 7, no. 3 (1975): 185-198. Hara, M, et al. "Calcium influx through a possible coupling of cation channels impacts skeletal muscle satellite cell activation in response to mechanical stretch." American Journal of Physiology - Cell Physiology 302, no. 12 (2012): C1741-C1750. Jennische, E, S Ekberg, and G L Matejka. "Expression of hepatocyte growth factor in growing and regenerating rat skeletal muscle." The American Journal of Physiology 265, no. 1 Pt 1 (1993): C122-C128. Mikkelsen, U R, et al. "Local NSAID infusion inhibits satellite cell proliferation in human skeletal muscle after eccentric exercise." Journal of Applied Physiology 107, no. 5 (2009): 1600-1611. Miyazaki, M, and K A Esser. "Cellular mechanisms regulating protein synthesis and skeletal muscle hypertrophy in animals." Journal of Applied Physiology 106, no. 4 (2009): 1367-1373. Moore, J C. "The Golgi tendon organ: a review and update." American Journal of Occupational Therapy 38, no. 4 (1984): 227-236. Nosaka, K, K Sakamoto, M Newton, and P Sacco. "The repeated bout effect of reduced-load eccentric exercise on elbow flexor muscle damage." European Journal of Applied Physiology 85, no. 1-2 (2001): 34-40. Nosaka, K, M Newton, and P Sacco. "Delayed-onset muscle soreness does not reflect the magnitude of eccentric exercise-induced muscle damage." Scandinavian Journal of Medicine & Science in Sports 12, no. 6 (2002): 337-346. Pedersen, B K, K Ostrowski, T Rohde, and H Bruunsgaard. "The cytokine response to strenuous exercise." Canadian Journal of Physiology and Pharmacology 76, no. 5 (1998): 505-511. Pedersen, B K, T C Akerström, A R Nielsen, and C P Fischer. "Role of myokines in exercise and metabolism." Journal of Applied Physiology, 2007: 1093-1098. Schoenfeld, B J. "Does exercise-induced muscle damage play a role in skeletal muscle hypertrophy?" Journal of Strength and Conditioning Research 26, no. 5 (2012): 1441-1453. Schoenfeld, B J. "The use of nonsteroidal anti-inflammatory drugs for exercise-induced muscle damage: implications for skeletal muscle development." Sports Medicine 42, no. 12 (2012): 1017-1028. Serrano, A L, B Baeza-Raja, E Perdiguero, M Jardí, and P Muñoz-Cánoves. "Interleukin-6 is an essential regulator of satellite cell-mediated skeletal muscle hypertrophy." Cell Metabolism 7, no. 1 (2008): 33-44. Sorichter, S, B Puschendorf, and J Mair. "Skeletal muscle injury induced by eccentric muscle action: muscle proteins as markers of muscle fiber injury." Exercise Immunology Review 5 (1999): 5-21. Tatsumi, R. "Mechano-biology of skeletal muscle hypertrophy and regeneration: possible mechanism of stretch-induced activation of resident myogenic stem cells." Animal Science Journal 81, no. 1 (2010): 11-20. Tatsumi, R, J E Anderson, C J Nevoret, O Halevy, and R E Allen. "HGF/SF is present in normal adult skeletal muscle and is capable of activating satellite cells." Developmental Biology 194, no. 1 (1998): 114-128. Toigo, M, and U Boutellier. "New fundamental resistance exercise determinants of molecular and cellular muscle adaptations." European Journal of Applied Physiology 97, no. 6 (August 2006): 643-663. Vierck, J, et al. "Satellite Cell Regulation Following Myotrauma caused by Resitance Exercise." Cell Biology International 24, no. 5 (2000): 263-272. Westing, S H, A G Cresswell, and A Thorstensson. "Muscle activation during maximal voluntary eccentric and concentric knee extension." European Journal of Applied Physiology and Occupational Physiology 62, no. 2 (1991): 104-108. Yamada, M, et al. "High concentrations of HGF inhibit skeletal muscle satellite cell proliferation in vitro by inducing expression of myostatin: a possible mechanism for reestablishing satellite cell quiescence in vivo." American Journal of Physiology - Cell Physiology 298, no. 3 (2010): C465-C476.